the live/rarities/authorized bootleg CD is available from MyPalGod records! 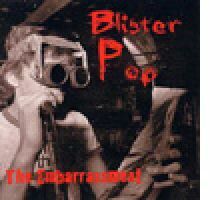 The Embarrassment's SketchbookFans, critics with a memory, and those new to the band who've stumbled upon news of the release of The Embarrassment's Blister Pop (My Pal God Records, www.mypalgodrecords, MPG039), may all well ask the question: what's the point? Why issue a "new" CD of a mixture of mostly lo-fi 'pre-history', live, practice, and otherwise secondary recordings of a band that never hit it big in the first place, and hasn't recorded a note in a decade? I've often described the Embarrassment as the greatest rock and roll group you never heard of, and as the years since their demise have passed this remains generally true. It's been over twenty years since their first recording, seventeen years since the Embarrassment first broke up, and a decade since their last studio recordings as a part-time side gig. They've been a classic story of what-might-have-been that's all too familiar to anyone who's been involved with a creative project that never had success or stamina to match its quality level. Their critical praise and still-faithful following of fans has not created what one might call a lasting legacy except by the long thin line of word of mouth. All content © Copyright 2019 by The Embarrassment & Bill Goffrier, all rights reserved. No content from this website may be used without permission from the band members.